Tenerife Peak is a hidden gem on Cape Breton Island, the trailhead is located between the villages of Cape North and Dingwall. Blink and you’ll miss the start of the trail which takes you up through a beautiful forest. The trail starts off gentle then takes you up a very steep slope for the remainder of the time, watch for loose rock as you near the top. As you near the summit, you’ll be above the trees and the reward is stunning 360-degree views of the surrounding landscape. After you’ve caught your breath hike the short ridge-line for even more beautiful views. The Franey Trail was undoubtedly my favourite trail during my visit to Cape Breton Island and it's just a short five-minute drive outside of the town of Ingonish. The trail starts at the end of a short dirt road and takes you up a winding forested trail for roughly sixty minutes before the beautiful view reveals itself at the top. You’ll spot a red Adirondack chair facing out over the ocean, it’s a beautiful spot to watch the sunrise. The real hidden gem is tucked around the corner and two minutes further around the trail. This short walk gives way to a breathtaking view over the valley and surrounding hills. You can plan your hike up the Franey Trail here. 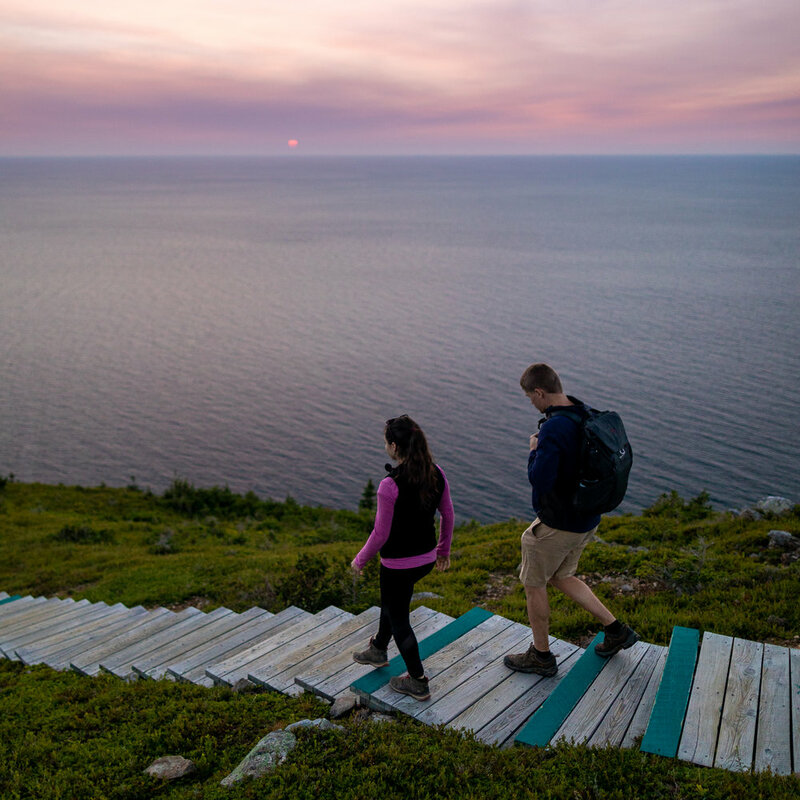 Easily the most well-known trail on Cape Breton Island, the Skyline Trail is a short fifteen-minute drive from the town of Cheticamp. This short hike along a well-maintained trail is family friendly and for all ages which makes it a busy trail but for good reason, the views are stunning! Starting at the parking lot you will pass through a densely forested area that opens up to a beautiful meadow leading down to the boardwalk installed by Parks Canada. The trail is especially beautiful at sunset to watch the sky and ocean glow a fierce orange as the sun sets below the horizon in the distance. The Louisbourg Lighthouse trail starts at the parking lot right next to Louisbourg Lighthouse. This is less a hike and more of a walk on fairly flat ground, perfect to do at the end of a long day exploring Cape Breton Island. There’s a small loop and a longer loop, both taking you through a windswept coastal forest and out over rocky cliffs revealing beautiful views of the Louisbourg Lighthouse. Keep an eye out for squirrels, birds and marine-life on this trail! - Wear supportive hiking shoes (Nike’s don’t cut it). - Take plenty of water, 1L should be plenty for these trails. - Tell someone outside of your hiking party where you’re going. - Stick to the designated trail to avoid erosion and damage to fragile environments. - Pack a small first aid kit. This was written in collaboration with Destination Cape Breton Association. As usual, all thoughts and opinions written here are my own.